People from all walks were in attendance at Bakker’s opening and where most people rejoiced in the candid expression the photographer captured from his subjects there was at least one very verbal dissident. I soaked in his youthful perspective and the opportunity to defend the work. He was a young photography student named Mario Andrade who was afraid these photos were false in their depiction of how devastating the subject’s lives truly were. The discussion lasted a good while & I promised him that if he wrote something that I would post it to the blog. Bueno, Mario, cumplo con mi compromiso. Ojala algún día serán tus fotografías expuestas en la galería y estaremos discutiendo como te ayudamos a resolver estos graves problemas de desigualdad. “Increíblemente, hoy cada día, podemos transitar por las calles de cualquier ciudad de México, con una naturalidad que se ha hecho tan común como respirar, sin mirar que nuestra gente, nuestro pueblo, está padeciendo. Está pereciendo. Se ha plasmado en la memoria de nuestra nación la falsa idea de que “en México no existe la pobreza extrema, ni la esclavitud” pero si usted es un ser sensible y observador, se dará a la labor de reír irónicamente a carcajadas al escuchar semejante declaración. Como en una copia de diferente papel, en México vivimos un holocausto palpable, donde gente muere todos los días y agoniza lentamente en nuestras avenidas; que también son sus avenidas. Victimas y presas de un sistema que sirve solo para mantener un diario vivir rutinario, los de clase media y media baja, se dedican a gastar su tiempo en trabajar en una empresa que probablemente los despachará cuando exista un recorte de personal, o cuando estén en tiempo de jubilarse; 8 horas diarias de labores lineales como mínimo; es un círculo vicioso que no para de girar. Al tener la necesidad de alimentar y sustentar una familia, las cabezas al frente, se envuelven en gastos para satisfacer dichas necesidades, trabajo duro, y deudas que se liquidan sólo al recibir la próxima paga. El tiempo libre y de familia se ha limitado a unas cuantas horas de convivencia, y ¿En qué tiempo queda el sensibilizarse por la sociedad? ¿En qué parte puede un extraño ocupar una prioridad en la existencia de un hombre con estas características? La necesidad de ver por los propios es la figura y todo lo demás puede englobarse en el fondo. ¿Y dónde queda nuestro pueblo que vive al margen de la escasez y la muerte? En las calles. Sin fin de ancianos y niños se ven forzados a buscar el pan de cada día en una sociedad que los ha materializado en un mismo concepto “el limosnero”. ¿Porqué no se recuerda el rostro de un niño, que un día antes también se acercó a nosotros a pedir un centavo? ¿Será porqué es parte del fondo? Lector. ¿Alguna vez le has preguntado su nombre a alguna de estas personas? Si es así, te felicito, pues has cruzado una barrera invisible pero casi indestructible. Si no, te invito a plantearte el pensamiento de si esas personas son tan ajenas a ti, tan diferentes a ti. Recuerda que tal vez sea más común saber el nombre de alguien que conociste en un bar o en la parada del autobús. Realmente no considero que sea el contexto de la situación, el pretexto que nos niegue un diálogo. Call it the 2012 phenomenon but I am changing in ways I never imagined I might change. Change is the only constant, right? But in general I thought I would always at least see most changes coming. These past few days spent in Mexico City found me saying “yes” to things I would normally say “no” to and vice versa. What could that be all about? Well, I rather not go there out of fear of how long and convoluted that road might be but I feel good about my choices and that’s good enough for me. Mexico City is a great place. Those of you who haven’t been in awhile or are a bit timid to travel to one of the largest cities in the world, just go. There is always something to see and do and more than likely some everyday something-or-another for a resident of the city will blow your mind. What I always find a little mind blowing (other than how there aren’t more car accidents with how crazy everyone drives) is how there is at max 2 degrees of separation between the people I meet (even in the most random encounter) with people I already know. This weekend the introduction to artist Karima Muyaes was one such example. Karima comes from a long lineage of artists and collectors and patrons and general cultural icons of Mexican history. Her father is the one who incorporated milagros into his artwork in the 1950s. He was also one of the first documentarians and later collectors of Mexican dance masks. I could go on and about how Karima’s family has intersected my family and friends over the years, but yesterday was the first time I met her. Karima is an artist and a jeweler. She is primarily a colorist who incorporates the influences from her childhood growing up in a family of archaeologists into very textural paintings that are reminiscent of textiles. Only having seen her work in photographs I was extremely delighted by the rich texture she uses and by the innate glow that her work emits. It was only seeing the paintings in person and perhaps placing a face and a soul to the artwork that it began to really resonate in this very personal way with me. This is so often the case. I receive countless images via the internet by artists who want to show at the gallery and so often I write them off before spending any time with them. Karima and her work wrapped me in their arms and made me feel warm. That is a feeling that I can’t deny. I gave up trying to decide whether it was the artist or the artwork that spoke to me the most. All I decided was that I need more time with these paintings and with this fascinating woman and thus I have set a date to show her work in September. I will use that time time peel back the layers and get familiar with the cultural references she makes. I will delve into the world of color that so often scares me away (oh how I do love the monochromatic). Maybe you will find your way into the gallery in September and share your thoughts with me. & please don’t chastise me for straying from what you might think is my aesthetic. I couldn’t say “no”. A brilliant political cartoon can sum up the follies of the day or the era with a lightning-quick precision unavailable to even the most economical editorial writers. The graphic satirist has at his or her command a whole arsenal for lampoonery: exaggeration, speech balloons, and the usual draftsman’s tools of line, shade, and even color. 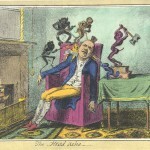 As “Infinite Jest: Caricature and Satire from Leonardo to Levine,” a show at the Metropolitan Museum of Art in New York, up through March 4, makes clear, humorous or scathing works on paper, such as those by Goya or Daumier, can reach a level of artistry that goes far beyond most political cartoons on the op-ed pages of newspapers. 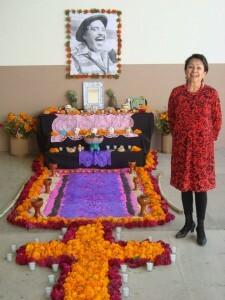 Maestra Margarita Fick standing in front of the altar she dedicated to Capulina. Día de Muertos has to be one of the most fantastic and colorful times of the year to be in Mexico and for the artist community and businesses at the Fábrica La Aurora it is a great excuse to really dress the place up and invite the community to enjoy and perhaps learn more about the timeless Mexican tradition. As per usual at the Aurora celebration, the Fábrica has chosen a non-profit to benefit and to champion their importance during the party and this year that honor goes to the ever-needed and desperately underfunded Mexican Red Cross who struggles valiantly daily to serve the growing San Miguel community. The pertinence to the celebration should be fairly obvious- if you don’t give, next year’s altar may be dedicated to you. Every year for the festival no expense is spared in the entertainment department. Upon arrival there will be marimba in the entrance patio. Then as the marimba starts to fade out you will catch the mariachi band further in and by the end of the night, you will surely be swinging your partner to the sweet sounds of Trio Los Románticos or Trio Los Compadres, who will be rolling out the nostalgia. It is also customary during this event for each studio and gallery to present its own unique altar dedicated to the deceased of their choosing. What is an altar you ask? Well, it is a fantastic and often elaborate offering to entice the dead to come back to be amongst the living. Be on the lookout for a beautiful multi-tiered, colorful assembled altar covered in bright colorful hand-cut tissue papers, full of the favorite food, booze and trinkets of the deceased being summoned. Make sure to visit each gallery and artist studio to see each of their personal altars. The main altar in the entrance patio will be a very special altar staged by the master cut paper artist Margarita Fick with the help of the lovely staff of Galería/Atelier and will be dedicated to the great Mexican comedian Capulina who passed away just a few weeks ago after a successful career entertaining three generations of Mexican families. If you don’t know Capulina, look up “El Santo vs Capulina” for some real “old school” Mexican cinema. Another altar in honor of the also recently deceased surrealist artist Leonora Carrington will be located near the café and will be created by local artist James Harvey. Expect an altar as surreal as the art of the artist. The final altar will be located in Section C of the Fábrica and will be built by Mary Breneman and Jim Corcoran in honor of the long dead Mexican Master David Alfaro Siquieros. A few special exhibits will also happen for this special occasion. Galería Alebrije is presenting a special collection of oil on canvas in celebration of the Day of the Dead, which includes paintings by Guadalajara Artist; Mario Oliva and Australian Artist, Rossmore James Campbell. Both Artists are based in SMA and will exhibit themed paintings of the Mexican Death culture from ancient Aztec goddesses to the more contemporary Catrina. Galería-Estudio Rolando García will be celebrating the closing of the exhibit for local etching artista Adolfo García. At Galería/Atelier don’t miss the assemblage show by French artist, Claude Mathey. There are wonderful stories being told there. Also they will be showing new work by papel picado and San Miguel’s favorite new artist in town, Margarita Fick.